The 192-member United Nations General Assembly observed a minute of silence yesterday as they stood in solidarity with the countless earthquake victims in Haiti. The UN flag flies at half mast, mourning the disaster victims, especially the 16 UN peacekeepers known to have died when the UN headquarters building collapsed. Some 150 staff members – including the Secretary-General’s Special Representative – are still unaccounted for. Some 3,000 of the troops and police of the UN Stabilization Mission in Haiti, there since the mid-1990s to enhance stability in the country, are in and around Port-au-Prince, and are helping to maintain order and assist in relief efforts. They also have started to clear some of the capital’s main roads to allow aid and rescuers to reach those in need. The UN General-Secretary ordered $10 million to be released from the Central Emergency Response Fund to kick-start humanitarian relief efforts. Entertainment mogul, Ted Turner, who is also the founder and chairman of the United Nations Foundation, a public charity created to support the UN, committed one million dollars yesterday to address the most urgent humanitarian and re-construction needs in Haiti. 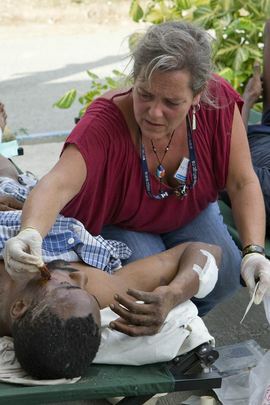 In addition, emergency communicaitons teams funded by the charity along with the Vodafone Foundation are arriving in Haiti to work on rebuilding the communications infrastructure crippled by the earthquake. The work of these teams, which includes the Télécoms Sans Frontières, will enable relief workers to coordinate the delivery of life-saving aid and supplies. UN experts and supplies are already arriving in response to the massive tremors. Josette Sheeran, who heads the UN World Food Programme, said that the agency is deploying its resources in Haiti and has airlifted from its hub in El Salvador an additional 86 metric tons of food – enough for half a million emergency meals, along with high-energy biscuits. The UN World Health Organization, led by its 12-member team of experts, is spearheading the health response to the earthquake. Donations to the UN Central Emergency Response Fund can be made on-line at www.unfoundation.org/cerf.